With the new deal, Wright-Phillips will now occupy a Designated Player spot on the roster. The London native is the franchise's all-time leader in career goals in MLS with 70, and across all competitions, 78. He also holds franchise records for career hat tricks with four, multi-goal games (16) and game-winning goals (20). 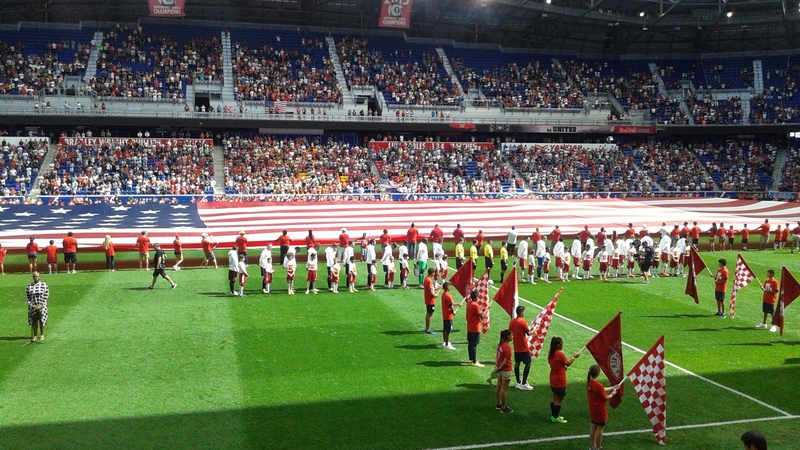 The Red Bulls and Real Salt Lake enter the field. Photo by Jason Schott. The Red Bulls and Real Salt Lake played a contentious match with a lot of drama, but neither team could find the net in the 0-0 draw on Saturday afternoon at Red Bull Arena. The Red Bulls had plenty of chances, as they poured in 18 shots, with five high-quality chances on net. Real Salt Lake had 12 shots, with five on net as well. Manchester CIty and Liverpool in the ICC at Yankee Stadium in 2014. Photo by Jason Schott. The International Champions Cup is in its fifth season, and this is perhaps its strongest schedule yet. The summer soccer tournament in the United States features an installment of the Clasico between Real Madrid and Barcelona in Miami on July 29, and the Manchester Derby on July 20 between Manchester United and Manchester City. It is still to be determined where Man U will play Man City, but there is reason to believe it could be Yankee Stadium. Man City is joint owners with the Yankees of New York City Football Club, and Yankee Stadium has not had an ICC game since Man City played Liverpool in 2014, so they are due to have a game in this tournament. The Mets announced that the previously scheduled exhibition game at West Point on Friday, March 31 has been relocated to Citi Field. The first pitch is scheduled for 1:10 p.m. The change of venue follows last week’s snow storm in the Hudson Valley which impacted the playing field at West Point. NYCFC's Rodney Wallace vies for the ball with Montreal's Victor Cabrera. USA Today Sports. New York City Football Club gave up a late goal to walk out with just a 1-1 draw with the Montreal Impact at a frigid Yankee Stadium on Saturday afternoon. This was a tough day for either side to get anything going on offense, as a rain and snow mix came down throughout the game. Rodney Wallace, Maxi Moralez,and David Villa. USA Today Sports. 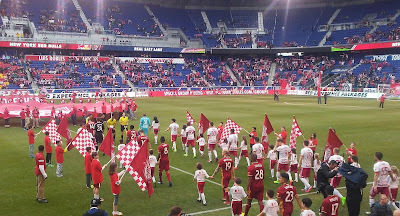 New York City Football Club had a big day in their home opener, led by a star, David Villa, who has been here from Day One of the franchise, and newcomers Maxi Moralez, Rodney Wallace, and Sean Johnson. NYCFC beat DC United 4-0 on Sunday afternoon at Yankee Stadium. It didn't take long for NYCFC to get on the board, as Rodney Wallace tipped in a rebound off the post of a rocket from Jack Harrison to give them the lead in the eighth minute. 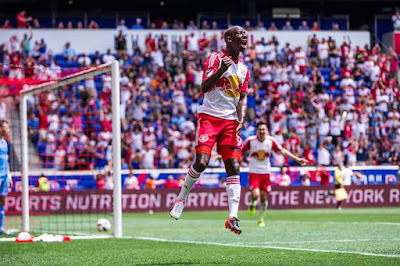 Just as they did in the season opener in Atlanta last Sunday, the Red Bulls won their home opener on Saturday afternoon because of an own goal. The Red Bulls earned a 1-0 victory over the Colorado Rapids on an own goal credited to Colorado's Eric Miller just before halftime. 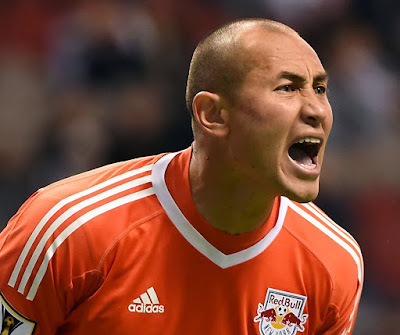 Red Bulls goalkeeper Luis Robles earned a shutout while setting a new league record for consecutive games played with his 142nd MLS appearance. The record was held by Chris Klein. The Mets have teamed up with Marvel Entertainment for Noah Syndergaard-Thor Bobblehead Day. Saturday, July 22 when the Mets host the Oakland A’s 7:10 p.m.. The first 15,000 Mets fans in attendance will get this one-of-a-kind collectible courtesy of Delta Air Lines. The Jackie Robinson Rotunda Gates will open at 5:10 p.m. 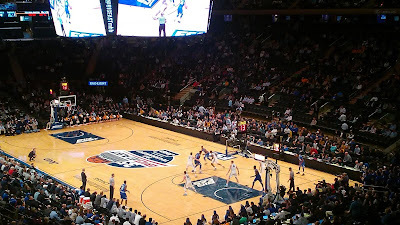 The tip off of the Big East Championship Game. Photo by Jason Schott. 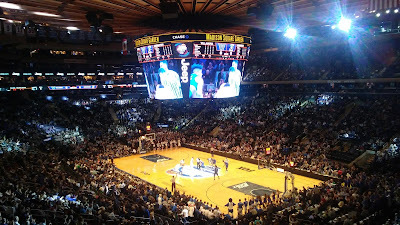 Villanova won the Big East Championship on Saturday night at Madison Square Garden with a dominant win over Creighton, 74-60. This is Villanova's second Big East Championship in three seasons. 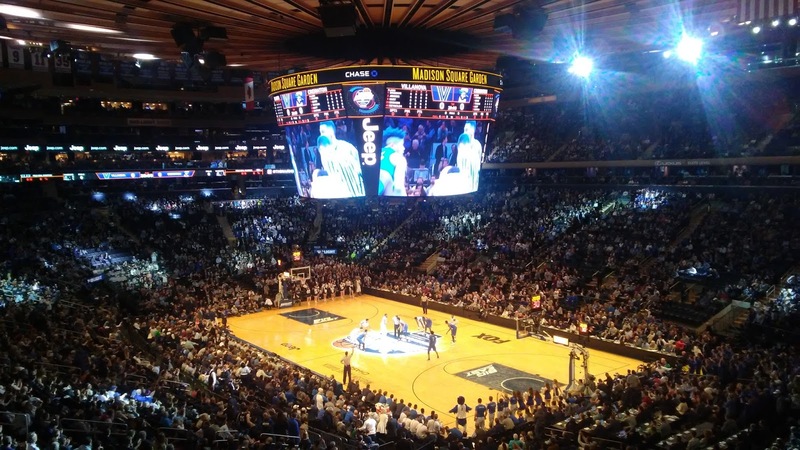 Seton Hall beat them in the Final a year ago, and in this year's Tourmanent, Villanova edged out the Pirates by two points, 55-53, on Friday night. Seton Hall sets up a play - Photo by Jason Schott. The Seton Hall Pirates beat the Marquette Golden Eagles 82-76 on Thursday afternoon in the Big East Tournament quarterfinals to set up a rematch of last year's championship game. Seton Hall will take on Villanova in the Big East Tournament semifinals on Friday night at 6:30 p.m. Seton Hall beat Villanova in the title game a year ago, but Villanova went on to win the National Championship. The Villanova Wildcats blew out the St. John's Red Storm, 108-67, in their Thursday afternoon quarterfinal matchup of the Big East Tournament at Madison Square Garden. 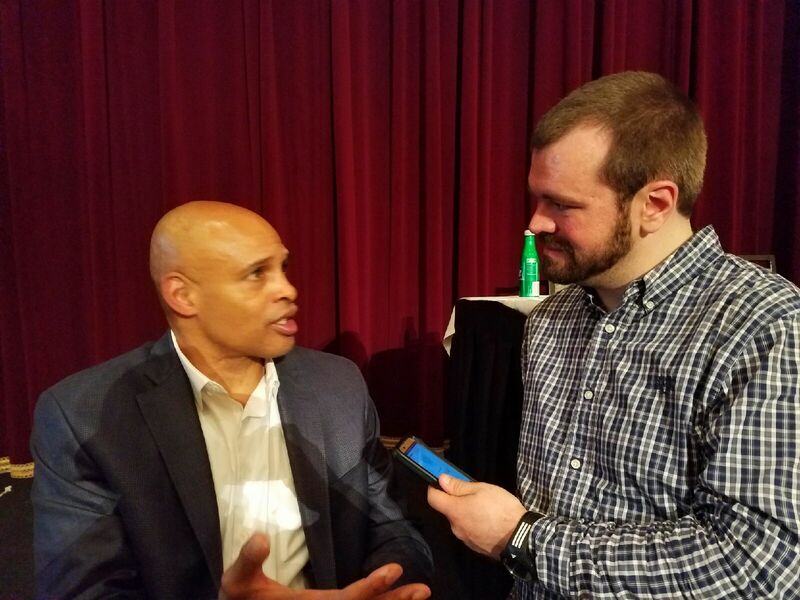 St. John's looked like a team that had played a brutal one-point win over Georgetown on Wednesday night just 14 hours before the noon tip on Thursday. It is not a surprise Villanova, the defending National Champion, won this one in convincing fashion, but the scope of the blowout might have been lessened if St. John's were given more time to recover from their opening game. 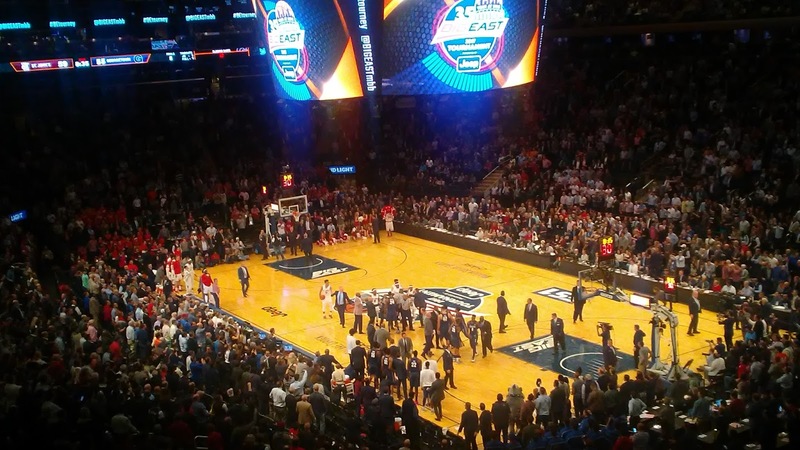 A brawl broke out in the second half between St. John's and Georgetown. Photo by Jason Schott. 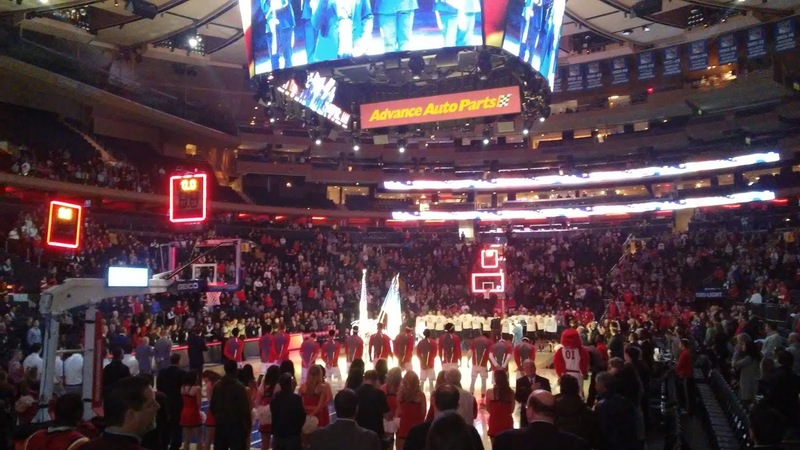 The Big East Tournament started on Wednesday night at Madison Square Garden with a legacy matchup between St. John's and Georgetown, and they added another monumental chapter to their history. In a gritty battle worthy of this rivalry, it was St. John's who came out on top, 74-73. St. John's moves on to play the top seed in this tournament and the defending National Champion Villanova, at noon on Thursday. The National Anthem being played before the opening game of the Big East Tournament between St. John's and Georgetown. Photo by Jason Schott. To celebrate 35 consecutive years of holding its Men’s Basketball Tournament at Madison Square Garden, the Big East Conference honored members of the New York City community who have served its residents and visitors over the past 35 years, along with members of the Big East community who have contributed to all 35 BIG EAST Men’s Basketball Tournaments. The honorees included former New York City Mayor David Dinkins, St. John's and Mets legend John Franco, and former Rangers star and Staten Island native Nick Fotiu. 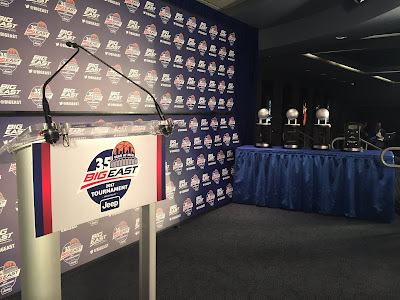 At a press conference on Wednesday afternoon at The Garden ahead of the start of the Big East Tournament, Villanova guard Josh Hart has been selected Big East Player of the Year, Creighton freshman center Justin Patton has been named Big East Freshman of the Year, and Butler head coach Chris Holtmann was tabbed Big East Coach of the Year. The winners were selected by a vote of the league’s head coaches, who were not permitted to vote for their own players. 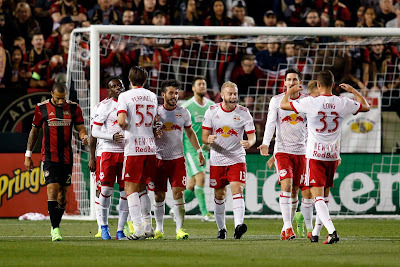 The Red Bulls opened the MLS regular season with a bang, as they scored two late goals to beat Atlanta United FC, 2-1, on Sunday night at Bobby Dodd Stadium in Atlanta, Georgia. This was the first game in the MLS for expansion club Atlanta United, and they took the early lead on a goal by Yamil Asad in the 25th minute. The scene during the National Anthem before St. John's - Providence. Photo by Jason Schott. 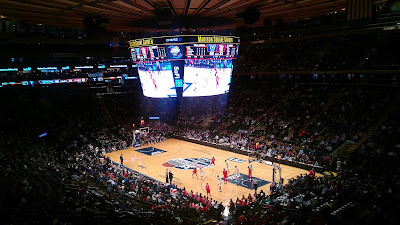 The St. John's Red Storm lost to Providence, 86-75, on Saturday afternoon at Madison Square Garden. It was a game in which the final score was not indicative, and led St. John's Head coach Chris Mullin to question his team's effort. 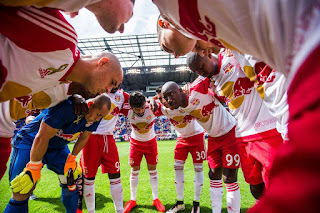 The Red Bulls will be looking to continue their run of dominance under head coach Jesse Marsch that has seen them win the Supporters' Shield in 2015 and finish with the best record in the Eastern Conference last season. They enter this season with a new look, as Sacha Kljestan will be the captain after Dax McCarty was traded in the offseason. 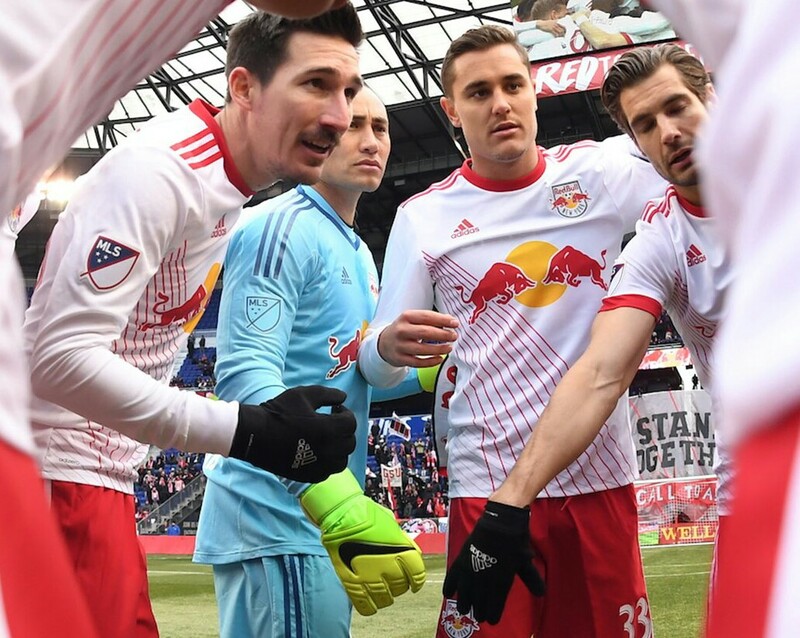 After losing the CONCACAF Champions League quarterfinal the the Vancouver Whitecaps on Thursday, the Red Bulls open the MLS season with a match at Atlanta United FC on Sunday, March 5 at 7:30 p.m., with coverage on FS1, Fox Deportes and Red Bulls Radio. NYCFC star David Villa. USA Today Sports. New York City Football Club begins their third season in the MLS this Sunday at Orlando City. Patrick Vieira will be entering his second season as the head coach, and European soccer legends David Villa and Andrea Pirlo will be back for their third season in New York. English soccer star Frank Lampard retired in the offseason after two injury-filled years with NYCFC. 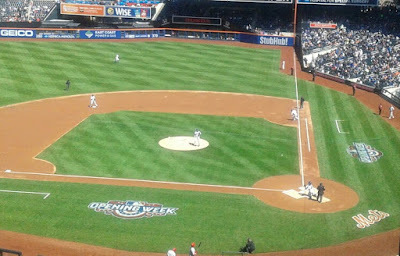 The home opener at Yankee Stadium will be on Sunday, March 12. They will then host the Montreal Impact on Saturday, March 18, and the San Jose Jose Earthquakes on April 1. All three games have 2 p.m. kickoffs. Red Bulls goalkeeper Luis Robles. 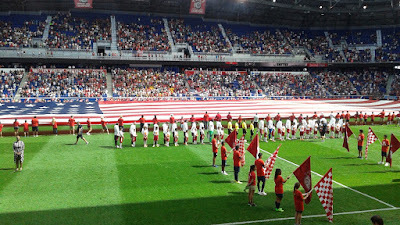 @NewYorkRedBulls. The Red Bulls have been eliminated from the Scotiabank CONCACAF Champions League on Thursday night after they lost 2-0 on the road to the Vancouver Whitecaps FC. The Whitecaps win the two-leg quarterfinal matchup, 3-1, on aggregate. 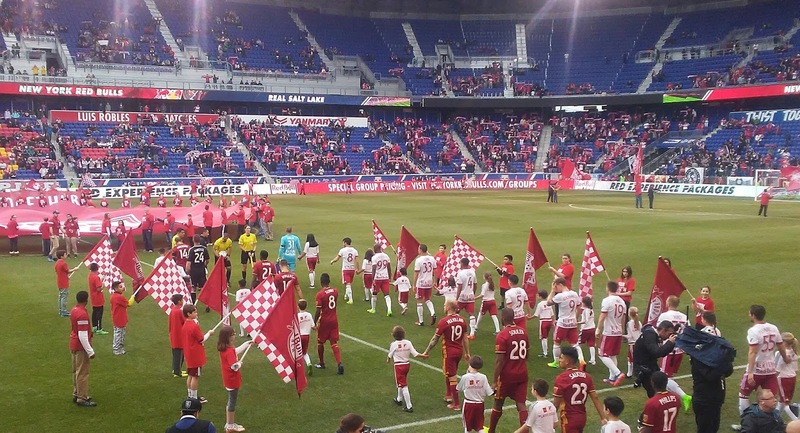 The first leg was a 1-1 draw at Red Bull Arena on Wednesday, February 22. Danny Jacobs after winning at Barclays Center in October 2012. Photo by @LolitaLens. On Thursday, Brooklyn Sports & Entertainment announced that their venues, Barclays Center in Brooklyn and Long Island's Nassau Veterans Memorial Coliseum Presented By New York Community Bank (NYCB), will be the sites for select Premier Boxing Champions Series (PBC ) events in 2017. This Saturday’s PBC welterweight showdown between Danny “Swift” Garcia and Keith “One-Time” Thurman in Brooklyn will be the first of a multi-fight schedule at Barclays Center and The New Coliseum Presented By NYCB in 2017. NYCFC star David Villa in action against LA Galaxy last season. Photo by Jason Schott. New York City FC released its roster for the 2017 MLS Regular Season, which begins this Sunday at Orlando City. The 2017 roster features 12 new offseason additions, including new Designated Player Maxi Moralez, 2015 MLS Cup champion Rodney Wallace, Venezuelan international midfielder Yangel Herrera and former Chicago Fire goalkeeper, Sean Johnson. Jim Nantz of CBS Sports. Photo by Jason Schott. March Madness is right around the corner, and CBS Sports and Turner Sports announced on Thursday that they will once again feature a marquee lineup of announcers for their seventh year of combined coverage of the NCAA Division I Men’s Basketball Championship. 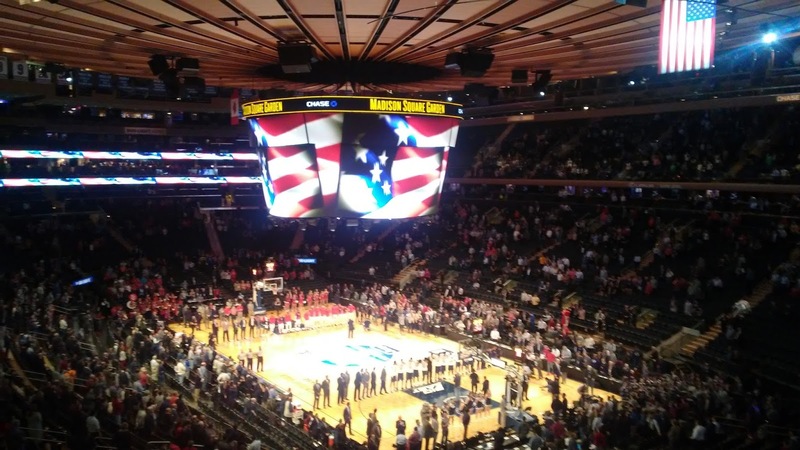 All 67 games from the 2017 NCAA Tournament will be televised across four national television networks – TBS, CBS, TNT and truTV – and via NCAA March Madness Live, beginning Tuesday, March 14, with the NCAA First Four on truTV presented by Northwestern Mutual. The New York Red Bulls Academy will expand its Regional Development School (RDS) programming with the addition of six new full-time, regionally based teams in 2017, the club announced today. 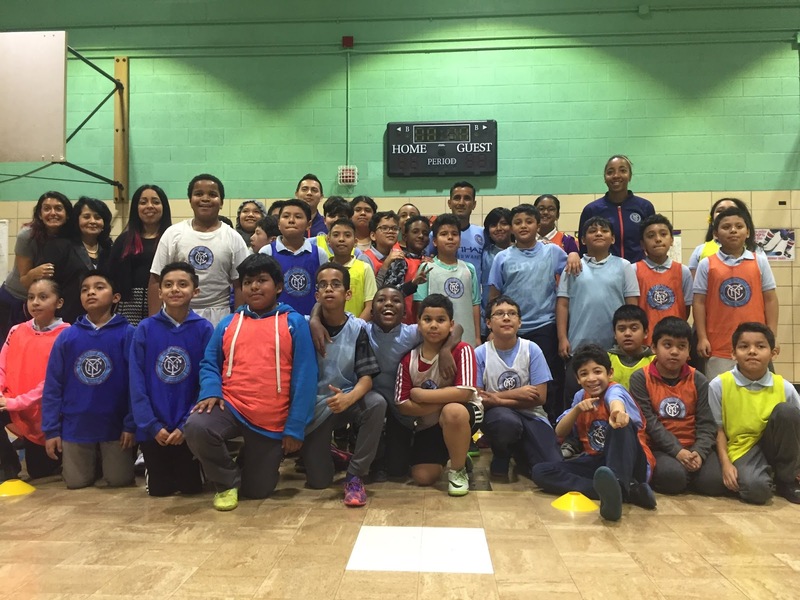 The New York Red Bulls youth programs are widely recognized locally and nationally as having a history of developing players for the Red Bulls first team. New York City Football Club introduced its newest Designated Player Maxi Moralez on Tuesday. Maxi spoke to media before an appearance at P.S. 83 / P.S. 182 (BBMS) in East Harlem, a current ‘City in the Community’ site where the Club supports free soccer programming, where he played small-sided games with the students.